Furniture designer and maker extraordinaire, Anthony Hartley talks about his unique design process and aesthetic. 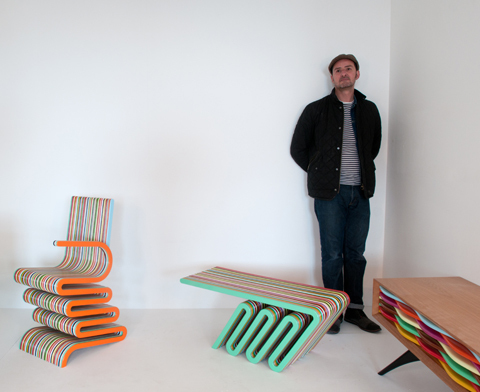 I discovered the colourfully unique work of furniture designer and 'jumped-up joiner' Anthony Hartley at Tent London back in September 2011. In this catch up interview I discover how the Yorkshire based artisan has developed his style over the years, from early training on the job to a university degree in design in the year 2000. 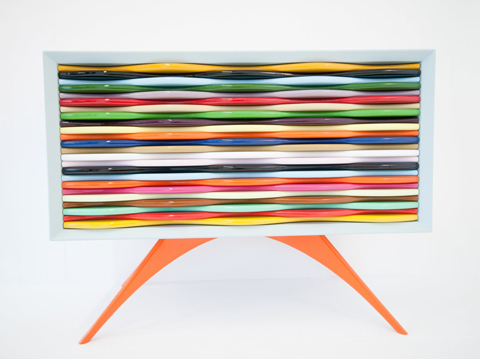 Anthony Hartley Edna drawer unit. You launched your latest colourful range at Tent London in 2011, what was the response and what have you been up to since then? The You Me Bum Bum Train experience is like no other.... here's my lowdown on what to expect from this intriguing participatory theatrical experience... plus news of how to get yourself a ticket for the extended run. A round up of more trends at Frieze Art Fair 2011 - featuring work by Andra Ursata, Zhang Xiaogang, Isa Genzken, Patrick Jackson, Evgeny Antufiev and David Altmejd. Our spiritual deficit is a worldwide phenomenon. I discovered some great new jewellery designers at the Renegade Craft Fair on the 8-9th October 2011. Meet Esoterica Bazaar, Uncommonly Beautiful, The Weekend Store and Foamy Wader. Unique hand made ceramic wonders from Melody Rose, JimBobArt and Zosienka & Rosie. Discovered at the Renegade Craft Fair, held on the 8-9th October 2011. The inaugural London Renegade Craft Fair took place on the 8th and 9th October 2011 at the Truman Brewery. Here's a look at some of the best illustration and wall art that I found, including The Bungaloo, Being Natalie, Julia Pott and upcycled wallets from Magic Industrie. Here are a few interesting new illustrators that I found at the Kingston MA show, part of Tent London: Jihyun Park, Zeun Han, Jacky Tong and Chen Bin Wu. Lighting design was not particularly in abundance at Tent London, but I loved a glow-in-the-dark ghost lamp by REthinkthings, blown glass shades by Curiousa & Curiousa and etched wood veneer lamps by Rachel Powell. Wonderful ceramics from the likes of Bodo Sperlein, Kitty and Dude, Ikuko Iwamoto and Richard Brendon. Plus exciting 3D product design from Shapeways. Lovely surface design on various applications: fab wallpaper from Flavor Paper and Kate Usher, textiles from Bluebellgray and a surprise appearance from Danish designer Lisa Grue, who I last met in Copenhagen! Loved the colourful textile design from Imogen Heath Studio, Stone and Spear and Deryn Relph. Plus wonderful laser cut wall art from Katie Heeks Designs. Fantastic furniture and product design at this years show back in July: particularly from Toby Whitworth, Miranda Holms and Samuel Sheard. Lovely Designer Maker craft from Chieh Ting Huang and Yaqi Zhao in Making_Makes_Me_Me. And an amazing Fine Art installation in the form of Rachael House's Feminist Disco.